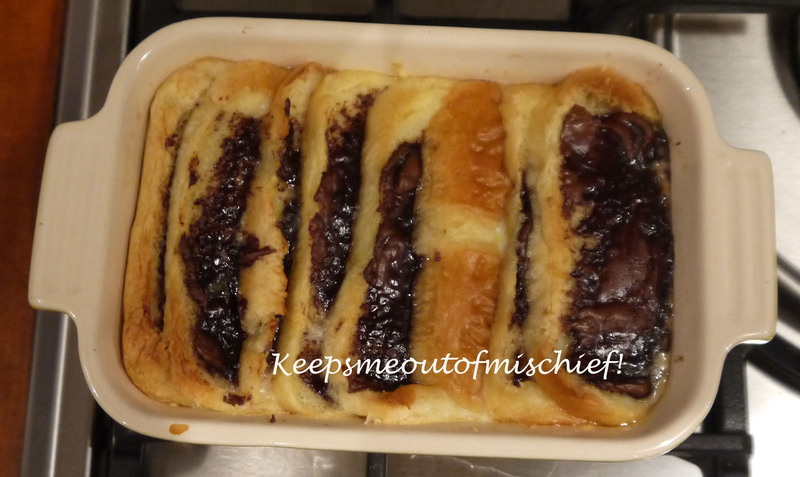 Chocolate Bread and Butter Pudding | Keeps Me Out Of Mischief! There are times when only a nursery pudding will do! This was a bit of an adventure for me; I never liked bread and butter pudding as a child (never very keen on milky/eggy mixtures), but this has changed my mind. Might just be the addition of chocolate that swayed me! Little Billy loves brioche buns for breakfast but I’d been a bit keen and bought too many so we needed to use some up quickly so I thought I’d try this recipe to see if I liked it now I’m a proper grown up! I didn’t spread the brioche buns with extra butter as there’s enough in them already and I was adding chocolate spread for goodness sake – how naughty do you want this pudding to be?! You will need (serves 3): 4 small brioche buns, 4 tsps chocolate spread, 1 egg, 1 tbsp caster sugar, 250ml milk, butter for greasing. Grease an earthenware dish. Slice the brioche buns lengthways into 3 slices. Spread one side of each slice with chocolate spread and arrange in the dish. Beat together the egg, caster sugar and milk and pour the mixture over the brioche. Leave to sit for at least 30 minutes so that the mixture can soak into the brioche. Whilst it is soaking, preheat the oven to 160°C/ 315°F. Place the dish in a large roasting tin and pour boiling water so that it comes halfway up the side of the dish. Bake in the oven for 35-40 minutes. Remove from the oven and allow to sit for about 10 minutes before you serve it. We couldn’t manage it all, having just eaten a huge roast dinner already, so I took leftovers to work and reheated it in the microwave – possibly more delicious than it had been the previous day! « I need a pudding that will please small children! Yay! I am so happy to see a bread pudding recipe that doesn’t include raisins. Chocolate is the way to go! Yummy yummy yum. Chocolate is always the way to go! Thanks for the recipe!